This is a locational name from a now "lost" medieval hamlet which at various times was recorded as Ravenshaw or even Rainshaw, the dialectal "link" with the modern surname spelling. This hamlet was a township within the parish of Prestbury in East Cheshire, although it seems to have disappeared before the 17th Century. The origination is from the Olde English pre 7th Century "Raven", a personal name of considerable popularity, plus the suffix "shaw", a wood. These habitational surnames were amongst the first developed surname forms, and equally they rapidly developed variant spellings as the nameholders moved away from their original villages. In the case of "Renshaw", the variants also developed because the "townships" had ceased to exist, so there were few definable spelling links. The early recordings include, in 1561 Sir Rauffe Renshae (Prest), buried at Prestbury and presumably the same as below; Alice Raynshawe of Prestbury (1570), John Rainshaw of Sale in 1647, and John Renshaw of Mobberley, Cheshire, given as a yeoman (1661); all had their wills registered at the county town of Cheshire. 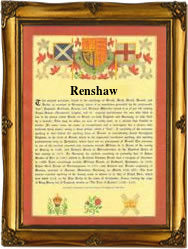 The Renshaw Coat of Arms includes three martlets, mythical legless hawks, indicating that the Renshaws made their mark by use of their brains, owning little in the way of lands. The first recorded spelling of the family name is shown to be that of Sir Ralph Renshae, which was dated 1547 - 1553, the Vicar of Potte, in East Cheshire, during the reign of King Edward V1, known as "The Boy King", 1648 - 1654. Surnames became necessary when governments introduced personal taxation. In England this was known as Poll Tax. Throughout the centuries, surnames in every country have continued to "develop" often leading to astonishing variants of the original spelling.